This stunning 30 acre parcel is one of the most private and picturesque large acreage properties in Alta, WY. It offers open meadows, lush pastures, aspen groves and Teton range views. It is ideal horse property. Dry Creek runs the length of the parcel and is perfectly situated for stream enhancement, including pond development to create a private fishery. Water rights included. It is accessed off a county maintained road just minutes from Grand Targhee ski resort, world class fishing on the Teton River, a national forest and just seven miles from town amenities. Jackson, Wyoming is only a thirty minute drive away. 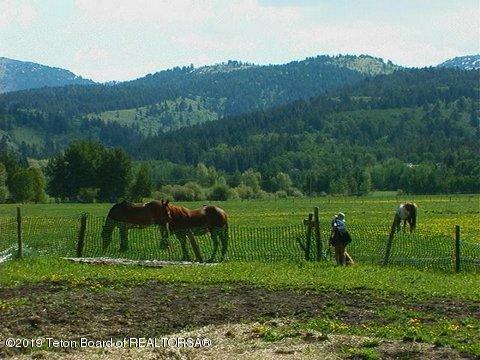 This beautiful property is located in an exclusive area neighboring ranches of similar size and value.The 4+ acre building site is surrounded by prime wildlife habitat which is home to moose, elk, deer and Sandhill Cranes. It is the perfect setting for your Wyoming dream ranch.